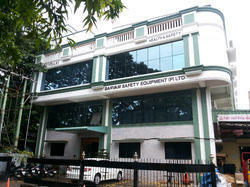 SARVAM SAFETY Equipment (P) ltd is based in India and is a Channel partner for reputed National and International Life Saving Equipment Manufacturers. It is a offshoot of the renowned Usha Fire Safety Equipments (P) Ltd - a market leader in Industrial Fire Fighting & Personal Protective Equipment over the past 26 years. Usha Fire Safety Equipments (P) Ltd has catered to the safety needs of various Industrial segments such as Construction, Automobiles, Power, Chemical, Engineering, Pharma, Refineries & Petrochemical, Nuclear power corporations, Fire service, Government sectors, Hospitals and various Institutions. SARVAM SAFETY is headed by the young and dynamic K. Praveen Shetty, one of the founding director of Usha Fire Safety Equipments (p) ltd. He has extensively travelled both in India and abroad, participating in various seminars and shows and in the process has garnered over 25 plus years of rich and relevant experience in the field of fire fighting & personal protective equipment. This ever-smiling, congenial Gentelman’s extensive experience, knowledge, energy and undying passion to remain ahead in the safety field is the spirit & motivation behind “Sarvam Safety”. Trading, Importer AND Exporter of Safety Gloves, Flash Lite etc. An undying passion to remain ahead of the times. All backed by our capable and experienced Marketing, Service, Logistics & Back end supporting teams. Our people are highly dedicated to cultivate our commitment to quality. Since, our workforce reflects diverse perspectives; we are able to form a group of intellectuals with varied persona that indeed helps us to meet the varying client needs. Our team comprises of expert sourcing agents, trained inventory managers and skillful sales and marketing personnel. Every member in our team adheres to the core values of integrity and is accountable to foster a collegial work environment. Our rapid growth is based on our unwavering focus to quality. Besides, our business governance is strategically based on ethical principles which are working as driving force in our success. We take pride to the dedication and commitment exhibited by our people, due to their dexterity it has become possible to source quality and streamline the distribution process. Moreover, our assurance to quality, cost and timely deliveries is the cornerstone in our success as a preferred entity for safety equipments. 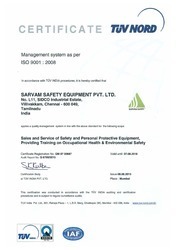 SARVAM SAFETY EQUIPMENT IS A ISO CERTIFIED COMPANY. WE HAVE OUR OFFICE AT VILLIVAKKAM. We strive to be the partner of choice, and our endeavors to become synonymous to trust are guided by stringent quality policy developed to depict our apprehension towards highest standards. 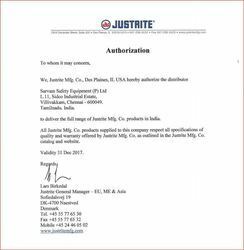 Besides our concerns towards the safety of rugged work environments equips us to curate top rated products from reliable vendor base only. Furthermore, we employ services of expert quality control associates who undertake the responsibility to rigorously verify the procured inventory. Our mission to attain highest levels of customer satisfaction is fulfilled by a consistent framework created by our team of experts. Our objective is to nurture enduring relationships; therefore we make sure that our products are widely acclaimed for its unmatched quality, durability and nominal price bands. In order to source the most demanded products, we conduct rigorous market analysis, and make every possible effort to anticipate the client needs.